The OWC ThunderBay 4 Mini is an excellent external storage solution for Mac users who often work with very large files, thanks to the speed of its four SSDs. However, because of its specific hardware requirements, it won’t be for everyone. The OWC ThunderBay 4 Mini is a professional-grade storage device that aims to make data transfer between you PC and the hard drives it contains extremely quick. It achieves this through a number of ways. First of all, it’s built with solid state drives in mind and comes with four 240GB SSDs included. Because solid state drives have no moving parts, they can write and read data much faster than traditional hard drives. The OWC ThunderBay 4 Mini comes with four easily-removable trays to install 2.5-inch drives in to take advantage of RAID. In certain configurations, such as RAID 0, you can use multiple disks at the same time, as if they were one drive. This can drastically speed up data transfers, and is useful for video and image processing. However, RAID 0 doesn’t offer data redundancy, so if one drive fails, you lose your data. Other forms of RAID, such as RAID 1, mirrors the data across drives, so if one drive fails, you have a backup of the file on three other drives. The disadvantage is that you cut down on storage space – instead of 960GB of space, we’d only have 240GB of space. What type of RAID array you choose will depend on what you want to use the OWC ThunderBay 4 Mini for – as super-fast storage or for backing up your data. Thankfully, the included SoftRAID software makes it easy to set up the RAID solution – though it must be noted that it’s only compatible with Mac machines. The 1TB version of the OWC ThunderBay 4 Mini is priced at £350 (around $440, AU$570), though you can also buy it in larger capacities. The OWC ThunderBay 4 Mini comes with two Thunderbolt 2 ports, which are much faster than USB 3.0 – four times faster in fact, with twice the throughput of USB 3.1. Our Thunderbolt 2 vs USB 3.0 vs eSATA guide goes into more detail over the benefits of Thunderbolt 2 (20Gbps vs 10Gbps). This increase in bandwidth means you can transfer large files, such as 4K video files, to the OWC ThunderBay 4 Mini, while simultaneously playing the video file on a Thunderbolt-connected monitor. If you have a recent Mac or MacBook (from around late 2013) such as the MacBook Air, 5K iMac or the 2013 MacBook Pro Retina, then you should have a Thunderbolt 2 (or even Thunderbolt 3 if your Mac is very recent) port included. Earlier Macs from between 2011 – 2013 may have an original Thunderbolt port, which can still be used with the Thunderbolt 2 connection of the OWC ThunderBay 4 Mini, but transfer speeds won’t be quite as fast. Non-Mac PCs also sometimes come with Thunderbolt ports, though these are rarer. This means that the OWC ThunderBay 4 Mini is probably of more interest to Apple owners than Windows users, though with its focus on fast speeds for storing large media files, this may not limit its target audience, as many creatives favor Apple devices. As well as Thunderbolt 2 and RAID support, the OWC ThunderBay 4 Mini comes with a sturdy aluminum case that will keep the drives (and the files you store on them) secure. The case can also be locked (a key is provided), which will help protect your data against all but the most determined thieves. 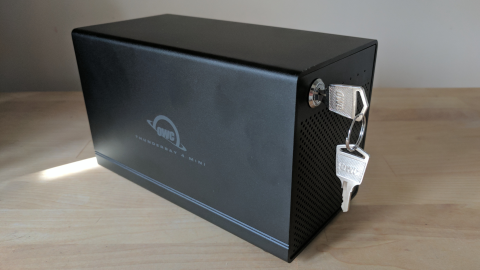 The case of the OWC ThunderBay 4 Mini has also been designed to keep the drives inside cool when under load, with a vented front that allows cool air to flow through the device. A 60mm fan also helps with air flow. The case also includes anti-vibration feet, which along with the design of the drive bays, helps eliminate noise when it’s in use. So how does the OWC ThunderBay 4 Mini perform? To test it we plugged it in to a MacBook Pro with Thunderbolt 2 ports, and configured the drives using the included SoftRAID software as RAID 0 – the fastest RAID array, though also the least secure as it doesn’t feature data redundancy. In our disk speed benchmarks we saw write speeds of 845MB/s and read speeds of 1112.5MB/s. These are very good speeds, and show what a performance increase RAID 0 provides. With these sorts of speeds you’ll be able to move, open and edit large files on the OWC ThunderBay 4 Mini pretty quickly, with the speed feeling like the drives were installed in your Mac, rather than in external housing. We also ran the benchmark tests with the drives in RAID 5. This RAID setup is recommended for people who want to use the OWC ThunderBay 4 Mini as a secure backup location for irreplaceable files, as it sacrifices speed and storage space for data security and redundancy. But how much of a sacrifice does it make? Quite a bit, as it turns out, at least when it comes to write speeds, dropping to 413MB/s (with read speeds dropping to 890MB/s). Because of these results, we’d recommend the OWC ThunderBay 4 Mini as a way of expanding your Mac (or Windows PC equipped with Thunderbolt 2 ports) storage, rather than as a bullet-proof backup solution. The SoftRAID software is decent enough, and makes setting up the drives in a RAID array easy, and the interface is straightforward and clear.